A Support Community Made For Performers. It takes more than a village to help a performer succeed. It takes a studio. To that end, DJM Studio offers constant feedback and encouragement; providing a safe space of support that helps performers build confidence. Our monthly open mic and wine and cheese get-togethers offer genuine bonding opportunities for student teaching artists and alumni alike. Our monthly newsletter which highlights the shows and creative works of our students further serves as connective tissue between performers. At DJM, teaching artists attend shows and showcases regularly; playing an important role at every stage of your development. Your careers in front of you and we’re behind you. Where to start? Being in Dan Manjovi’s class is pure joy. Dan is a master teacher. He creates a supportive and caring environment that allows you to be vulnerable, take risks and ultimately be your best self. I am more than grateful to be part of this wonderful community, to have learned so much about myself, and my voice, and to be singing! Through Christopher Scott’s guidance, I have transformed as both an actor & an individual. I have learned the value in pushing my own boundaries by moving beyond my comfort zone in order to find depth and deeper truths in my work. Dan is a wonderful teacher, coach, and musician. Excellent technique. Encouraging, he is precise and specific. Over the courses, he has clarified and translated the language of music in singing. Dan’s presence has nurtured my artistry. I couldn’t really sing before, but now have a singing voice in me, as an actor. And I love it. He is brilliant! Dan’s Open Mic is heart-warming and quite magical! Chris has the power to transform an inexperienced, quiet performer into a confident actor. He can understand, relate and work with any student, providing the right tools and techniques to progress as an actor working outside their comfort zone. There are very few master class situations in which the teacher completely focused on helping the singer achieve a deeper understanding of the song by creating a supportive and collegial environment. The vocal warm-ups and strength building exercises which begin each class are both practical and invaluable. I learned as much from watching Dan work with other singers and guiding them toward solid interpretations of their songs than I did from working with him personally. Dan's methodology in helping a singer deconstruct song was useful and informative; his ability to zero in on the musical fault lines and address them in a positive and coherent manner was incredibly helpful. I always leave class with a deeper understanding of the songs I am working on and a more solid technique in approaching the parts that have been challenging. 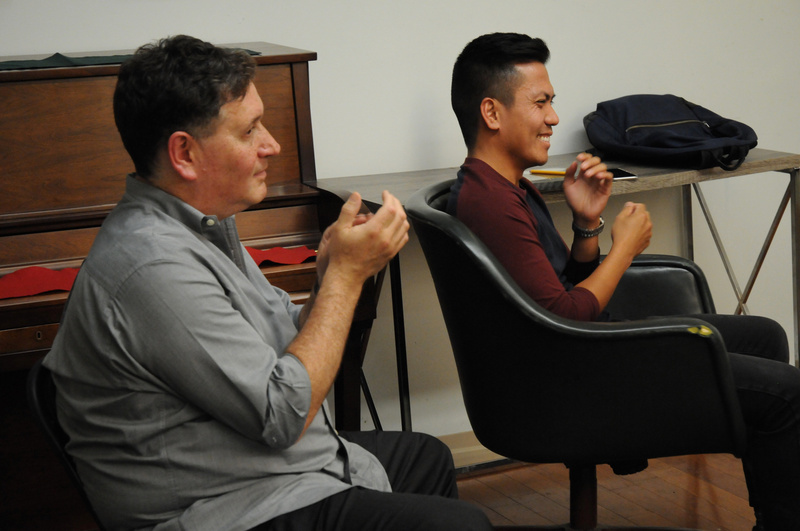 Dan's teaching has bolstered by confidence as a performer and made me more appreciative of the art of singing. John has vast knowledge of everything that is music and musical theater. He is an excellent vocal coach and a great credit to the musical theatre world. Chris is such a lovely, personable, caring, knowledgeable and down-to-earth person. He provides a nurturing atmosphere where one feels attuned, confident and secure without ever feeling judged. I’ve learned so much under Chris’ guidance and I can’t wait to see what the future holds in store. As Alexandra K. Trenfor once said "The best teachers are those who show you where to look, but don't tell you what to see". Since taking both group and private classes with Dan Manjovi, I’ve grown tremendously as a singer. In the past ten years, of group classes as well as at the Open Mics, Dan has created a wonderful community of people who share the love of song and entertaining. It’s been a wonderful experience! Dan is a very endearing, encouraging and caring supportive teacher and person. In each of his classes, I feel lifted, supported and realize just how much I love to sing. He creates a warm and welcoming environment for all. Every presentation gets better and better as we get to shine in our creativity. 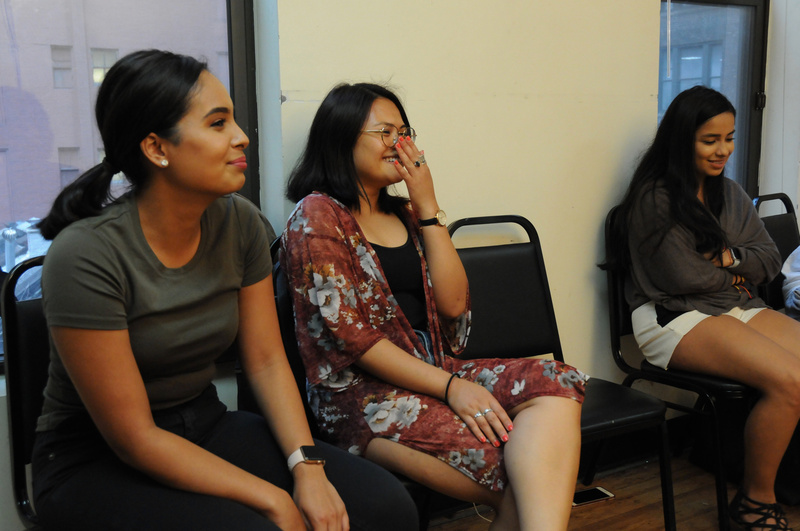 I was referred to Chris Scott's Acting class by one of my closest friends, she encouraged me to try something new and learn how to overcome my fear of public speech. Chris' class taught me how to be comfortable with my own mistakes and gave me the opportunity to learn from them, because there's always room for improvement. Chris is an amazing instructor especially if you have little to no acting experience such as myself, but don't worry everyone in class is amazing and welcoming; so never fear and take the risk like I did! Dan manages the incredible feat of meeting every student at their level. He uses his deep knowledge and love of music to create ways to expand each student's abilities. I have seen many diverse talents flourish under his guidance. I am the singer I am because of his craft, kindness, and his care. Dan Manjovi continues to nurture my love of music and singing through his masterful teaching techniques. His ability to simultaneously play piano, transpose the key, watch my performance and give constructive feedback still amazes me, He should trademark the Manjovi Method! As a first time acting studio I felt somewhat apprehensive about joining a class with others that had prior acting experience. However, Chris is skillfully able to bring all levels together and create a warm and collaborative learning environment. I really look forward to his classes, am learning a great deal, and feel inspired to continue! I’ve been taking the Vocal group class for over 4 years and I love it! Dan is a great teacher who finds the best in any song of the students at all levels, and his advice makes quick yet impressive differences. The class has camaraderie of a sport team in which we support and inspire each other. And the monthly Open Mic and Annual Presentations are fantastic opportunities to perform in front of broader audience and learn from the students outside of the class. 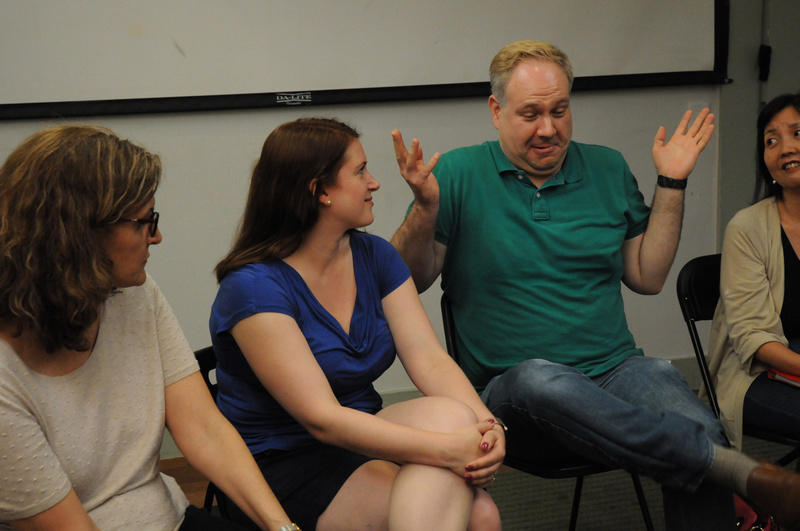 Chris offers both novice and experienced actors a nurturing environment in which to explore persona, connect to character and situation, and develop the craft of acting. The warm up exercises are a physical workout, and the class dynamic is collegial and encouraging. The lessons learned can be applied to acting, singing, and to life. I find three distinct elements in Dan Manjovi's multifaceted teaching program.First is the Moment: each mini-performance, whether in class, in private lesson, or at an open mike or annual presentation -- good or less so, it's never indifferent and always compelling. Next is Time's sneaky way of showing amazing growth in each student's capacity and ambition under Dan's dedicated and thoughtful guidance. And finally, almost without seeking, there's Community: a band of students and their teacher both hard at work and all together enjoying essential play time. Thanks Dan! For me, John Bowen is the best in the world. All categories, musicianship, creativity, brilliant player, arranger, accompanist, soloist, and sterling, compassionate, generous human being. 1. As a pianist, he can play ANYTHING at first sight. And, he usually makes the gazillion songs he knows sound better than they were originally written and has the knowledge and instinct to “play to the vocalist”. 2. He is always in control, using a vast knowledge of musical history, theory, techniques and technicalities; human breath and voice apparatuses and how to make them work for the best tonality. 3. His classes are bonus classes: Students not only learn about things specific to their voices and presentations; but, are privileged to learn as Dan helps other students at all different levels to learn and improve about their voices. Always gentle, always knowledgeable, always patient; Dan’s classes are positive, supportive environments where everyone grows together. Ergo: from door hinge to I-can-carry-a-tune-again! And I have a whole new family of my own choosing! 4. The group structure that Dan uses accustoms students to be more comfortable with performing before live audiences – given that we perform for each other at each class. 5. This is not a “does anyone have an opinion on what we’ve just heard?” kind of class. Dan IS the instructor and his opinion is the only one we want to hear anyway. And, because his opinion is spoken genuinely, and in a way that is never demeaning of condescending. 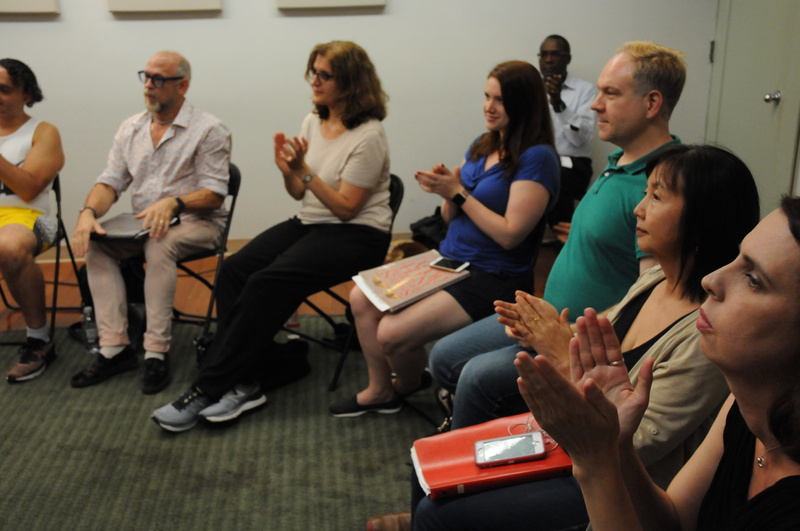 Dan Manjovi’s singing class is terrific because he is able to address - in one 2-hour group session - the needs of all the students, be they beginners or accomplished singers, and make his comments and suggestions relevant for everyone. You don’t just learn from him but from the class as a whole. I am delighted to share that my many years of experience as a vocal student of Dan Manjovi has been pure joy! He is a truly outstanding teacher of singing technique and performance. He not only allows, but strongly encourages individual creativity. Dan has a knack for being able to zoom into the areas where you might need help and then he lets you soar! He is also an amazing accompanist, which is immensely helpful. I can't say enough good things about Dan. Dan’s class provides a supportive atmosphere where a singer of any level can explore his/her artistic freedom. Dan helps the singer realize their potential by honing in to the singer’s strengths which helps the singer build confidence in their technique. Lastly, Dan’s musicality is unmatched - he is a great composer, singer, pianist, and teacher. It takes a special type of person to be a mentor. There are teachers and professors who educate on a subject or on your craft. Chris Scott is so much more than that. His knowledge of theater and technique is unmatched, evoking Chekov or Meisner comes so naturally to him that its a treat to see him just break down a scene. What really separates him from any other teacher or coach that I've worked with is his ability to mold his students potential into real progress. When I trained under him the scenes he had chosen for my study helped me to discover and identify my own strengths and weaknesses as an actor. His work and direction taught me what it truly means to understand a piece at every step of the process, from words on a sheet of paper up to a fully realized performance. His method of teaching is refined, delicate and effective. In working with Chris I think I not only found a great mentor, teacher and coach but also a lifelong friend.